Attachment Control Device: In simplest terms, the optional Attachment Control Device makes it possible for the loader and attachment to communicate. Bob-Tach® Attachment Mounting System : Change attachments in less than a minute! You can replace a bucket with a pallet fork, landscape rake, auger, grapple, and more than 55 Bobcat attachments quickly and easily with the Bob-Tach® mounting system. Control in Your Hands: With Bobcat compact skid-steer loaders, you can feel and control the loader’s drive, engine torque and tractive effort—you can push your machine to the limit without an engine anti-stall system robbing you of power when you need it the most. 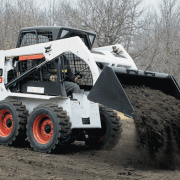 Faster Cycle Times: Hydraulic pumps in Bobcat loaders are matched to cylinder size and loader lift capacity to provide fast cycle times that help you get the job done faster. Hydraulic Bucket Positioning: Optional hydraulic bucket positing keeps your bucket level when raising lift arms, reducing spillage and allowing you to work more efficiently. More Torque: Bobcat loaders reach maximum torque at a lower RPM to minimize stalling and save time and fuel. Powerful Breakout Forces: High-efficiency hydraulic pumps deliver more power, matched to demand and providing breakout forces. Quick Couplers with Pressure Release: By simply pushing the coupler inward, the hydraulic oil is released through a return line back into the machine. The result is clean, quick attachment changes time after time. Quicker Turning: Bobcat’s weight distribution has been designed for the best turning and skidding to deliver ideal performance, with 70% of distribution in the rear and 30% in the front. This quick turning reduces fuel consumption and power requirements from the engine, increasing the life of drive train and tires. Remote Control: All loaders equipped with Selectable Joystick Control or All Wheel Steer can be operated by the Radio Remote Control. Bobcat Company is the first and only company to introduce a new way to operate your equipment without having to have an operator in the cab. This is a smart solution for hot, dusty environments or on jobs where you’d rather be outside of the machine. Ride Control Option: Optional ride control is the cushioning of the loader lift circuit, which helps increase the smoothness of the ride. Stronger Hydraulics: The Bobcat engine, hydraulic pump, horsepower and cubic-inch displacement are configured precisely for each model’s specific operating capacity. Transverse Engine/ Belt Drive: Thanks to the Bobcat belt-drive system, loader engines can be run slower, resulting in a quieter machine that lasts longer. 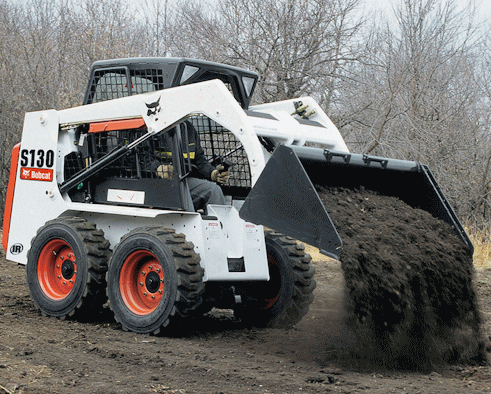 This drive belt system allows Bobcat loaders to use an optimized engine-to-pump package, making it more efficient.